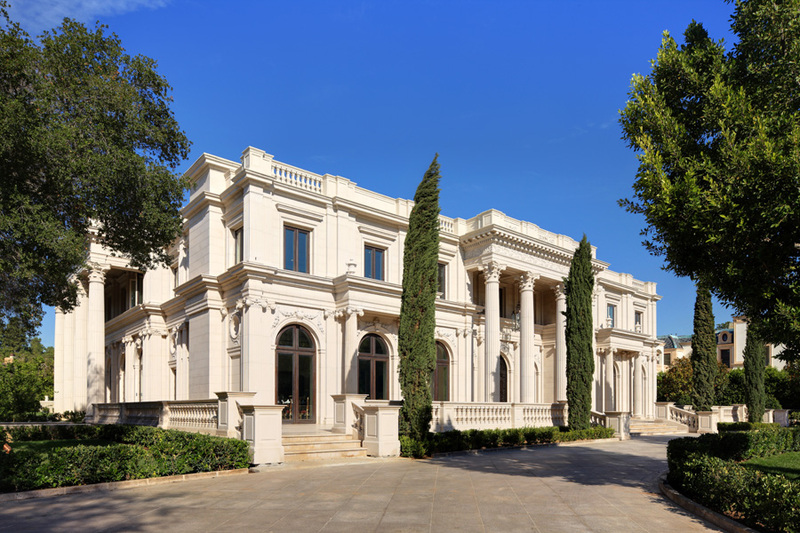 Finton Construction is one of California's most preeminent builders of high-end custom homes. The company was founded by John Finton, a seasoned construction and development professional who holds a Bachelors of Science in Business Administration and Real Estate from California State Polytechnic University. He works closely with the top echelon of design professionals to construct luxury homes that are worthy to be featured in Architectural Digest, Veranda, and NY Times. See some of Finton Construction's homes below. Built in 2010 and perched atop 0.41 acres of land overlooking Rock Creek Park, this breathtaking stucco contemporary-style residence was especially designed with corporate entertaining in mind. The Michael Marshall Design-designed home features approximately 10,897 square feet of living space with four bedrooms, five full and two half bathrooms, foyer with staircase, elevator, two-story living room with floor-to-ceiling windows and fireplace, two-story dining room, gourmet kitchen with butler's pantry, wine cellar and tasting room, family room, home office, 18-seat home theater, home gym with sauna, salon, and an eight-car subterranean garage. Outdoor features include courtyard with fountain, expansive deck, patio, hot tub, and an infinity-edge saltwater swimming pool. This historic stone mansion located in Winnetka, IL is situated on 1.25 acres of land, set among towering trees, formal gardens, and a meticulously manicured front lawn. 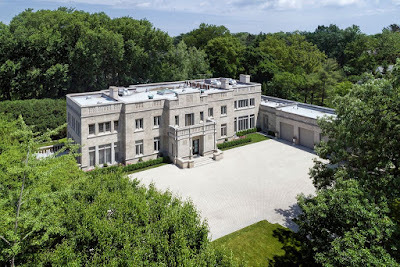 The Art Deco-style home was built in 1929 and later modernized by Chicago's Tigerman McCurry Architects. It features approximately 12,000 square feet of living space with six bedrooms, seven full and two half bathrooms, two-story foyer with staircase and center skylight, formal living and dining rooms, gourmet kitchen with stainless steel appliances, a breakfast nook with built-in bench, family room, paneled library with fireplace, home office with fireplace, recreation room with wet bar, media room, and a four-car garage. Outdoor features include a motor court, stone and brick patios, and a vine covered pergola. William H. Harrison founded his Harrison Design firm in 1991 in Atlanta, GA. The firm is now seven offices strong around the world with locations in Washington, DC, St. Simons, and Shanghai. Harrison operated his own construction company for 12 years before launching his architectural firm. He is a registered architect in 12 states and holds a Bachelor of Science in Architecture degree from Georgia Tech. 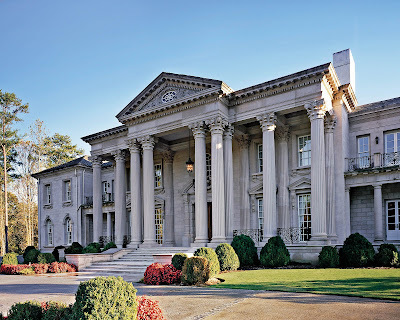 Harrison Design specializes in high-end residential architecture, interior design, and landscape architecture and their work has been published in magazines that include Architectural Digest, Architect, Veranda, and Traditional Home. Take a look at some of their beautiful homes below. 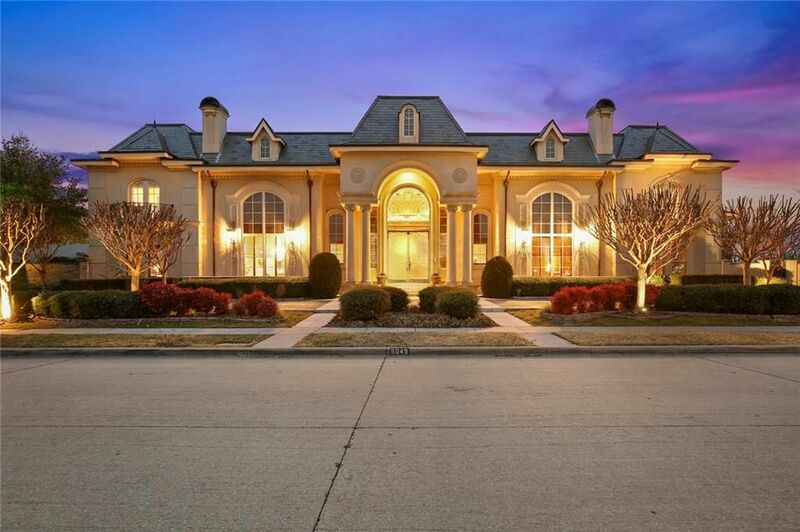 This Mediterranean-style mansion in Fayetteville, AR was built in 2010 and is situated on 1.4 acres of land overlooking the 5th, 6th, and 15th holes of Blessings Golf Course. 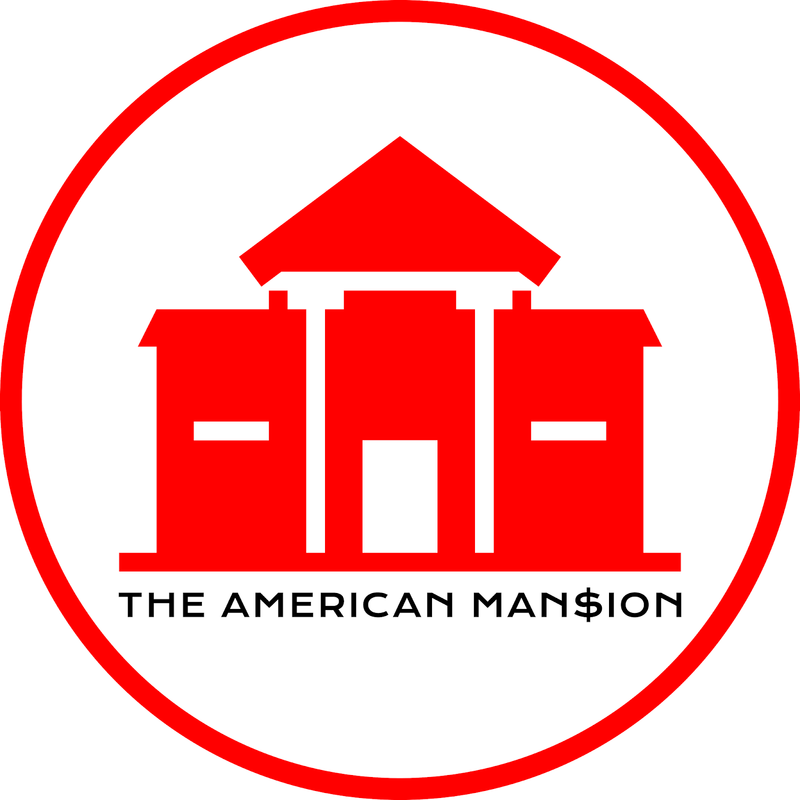 It features approximately 15,209 square feet of living space with five bedrooms, five full and three half bathrooms, foyer with two-story rotunda tower and staircase, two-story great room with fireplace, two-story dining room with wet bar, gourmet kitchen with breakfast bar, two-story family room with fireplace, home office with fireplace, an expansive lounge with kitchenette, wine cellar/tasting room, media room, home gym, and garage parking for five cars. Outdoor features include a porte-cochere, three motor courts, Juliet balconies, terraces, covered patio with BBQ kitchen, loggia with fireplace, pool patio, and a swimming pool. 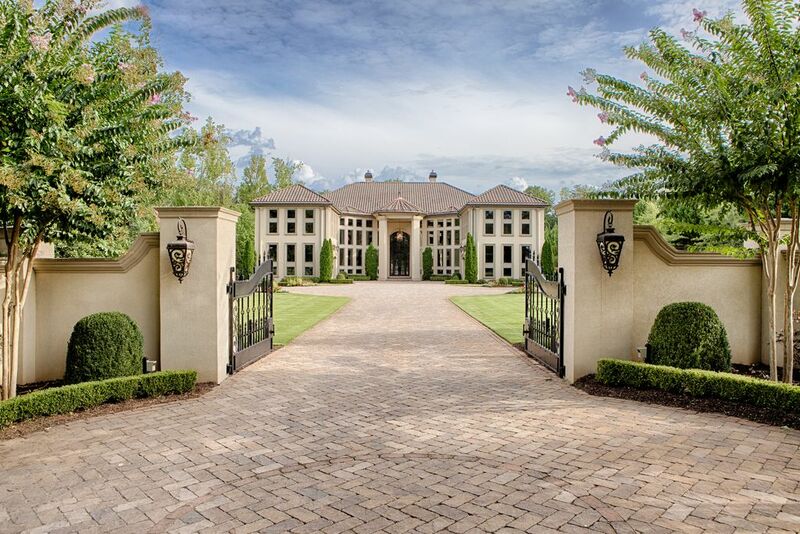 This Mediterranean-inspired mansion in Marietta, GA was built in 2011, is situated on 2.2 acres of land, and boasts some 157 windows that allow peerless visuals of the home's meticulously maintained grounds. It features approximately 16,080 square feet of living space with eight bedrooms, 10 full and two half bathrooms, two-story foyer with dome ceiling and open riser floating spiral staircase, elevator, formal living room with fireplace, formal dining room, two-story great room with dome ceiling and limestone fireplace, wet bar, open concept gourmet kitchen/breakfast room/family room, two lofts, an art studio, upper level recreation room, lower level game room, home theater, wine cellar and tasting room, exercise room, and two two-car garages. Outdoor features include a gated entrance, expansive motor court, front covered porch, two covered terraces, two loggias, pergola with BBQ kitchen and fireplace, patio, swimming pool with spa, water and fire bowls, fire pit, and a lighted tennis court. 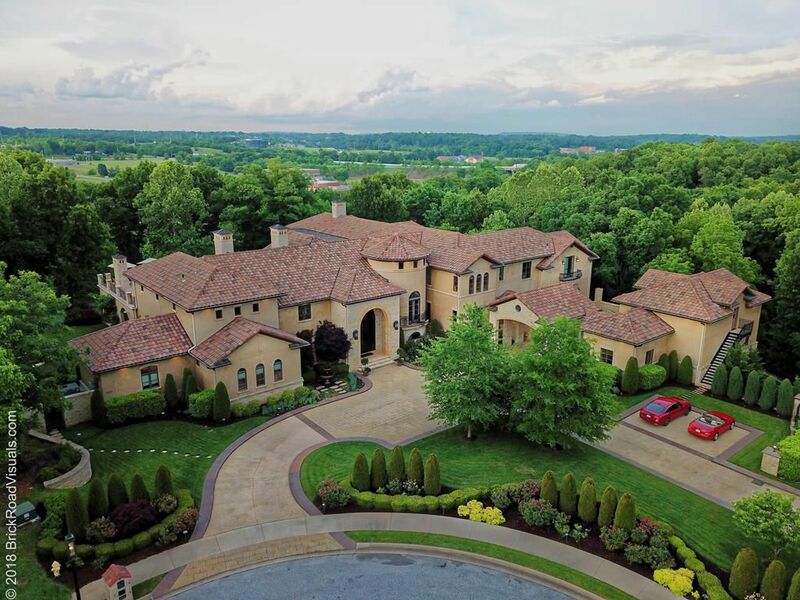 This Tuscan-inspired mansion in Aurora, OH was built in 2008 and is situated on just over two acres of land. The stone and stucco home fronts the area's prestigious Barrington Golf Course and features approximately 14,784 square feet of living space with four bedrooms, five full and four half bathrooms, foyer with staircase, formal living room with fireplace and coffered ceiling, formal dining room, two-story great room, gourmet kitchen with double islands, breakfast room, wet bar with wine storage, family room with wood paneled media center, lower level recreation room, wet bar, lounge, an eight-seat home theater, exercise room, a home office, and garage parking for six vehicles. Outdoor feature include a motor court, breezeway, terraces, covered patio with BBQ kitchen, pergola, fire pit, and a swimming pool with deck jets. PROFESSIONAL'S SHOWCASE: Landry Design Group, Inc.
Landry Design Group, Inc. is based in Los Angeles, CA and was founded in 1987 by Richard Landry, AIA. Landry has been featured numerous times on the Architectural Digest AD100 list since 2000. 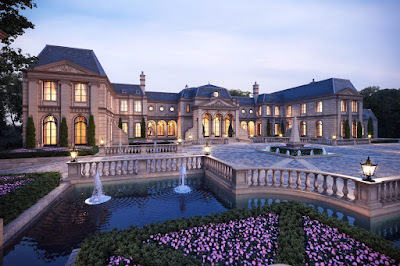 His international high-end residential design firm has designed homes for such notables as Wayne Gretzky, Tom Brady and Giselle Bundchen, Sugar Ray Leonard, Rod Stewart, and most recently, Mark Wahlberg. 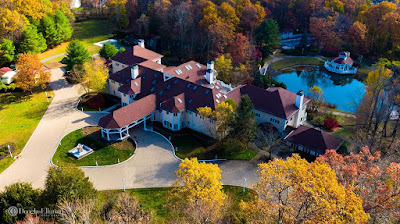 See some of Landry's spectacular homes below. This stately Colonial-style mega mansion in upscale Saddle River, NJ is the former home of music mogul and businessman Russell Simmons (net worth $350 million). The home was originally sold by Simmons' ex-wife Kimora Lee in 2011 for a cool $10 million but is currently back on the market for $8.9 million more ($18.9 million). 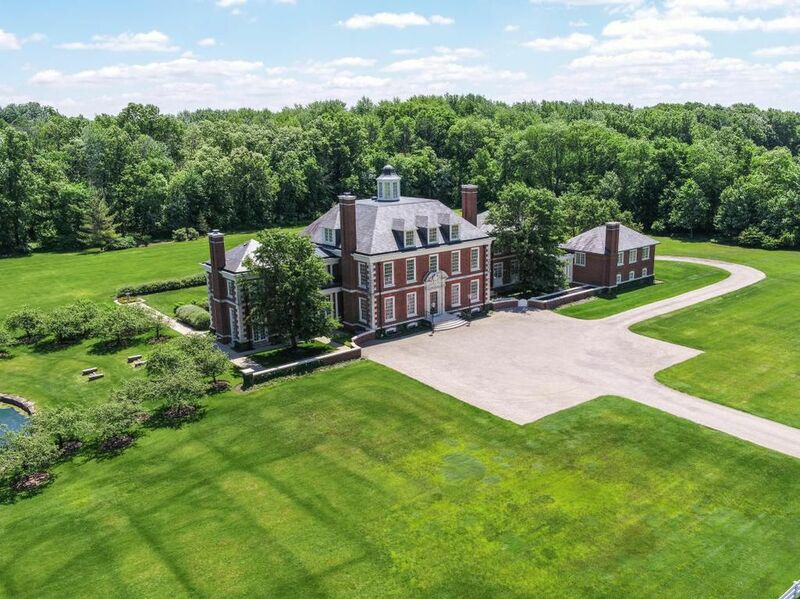 Built in 1996 and situated on four acres of land, the palatial home features approximately 35,000 square feet of living space with eight bedrooms, 12 full and three half bathrooms, two-story foyer with floating double staircase and hand painted dome ceiling, formal living and dining rooms with fireplaces, two-story great room with fireplace, expansive gourmet kitchen, breakfast room, sun room, family room with fireplace, wood paneled home office, wine cellar/tasting room, a 14-seat TK Theaters-designed home theater, indoor swimming pool, and a seven-car garage with three lifts. Outdoor features include two gated entrances, motor court, terrace, multiple balconies and patios, formal gardens, koi pond, waterfalls, free form swimming pool with spa, and a full-service cabana. 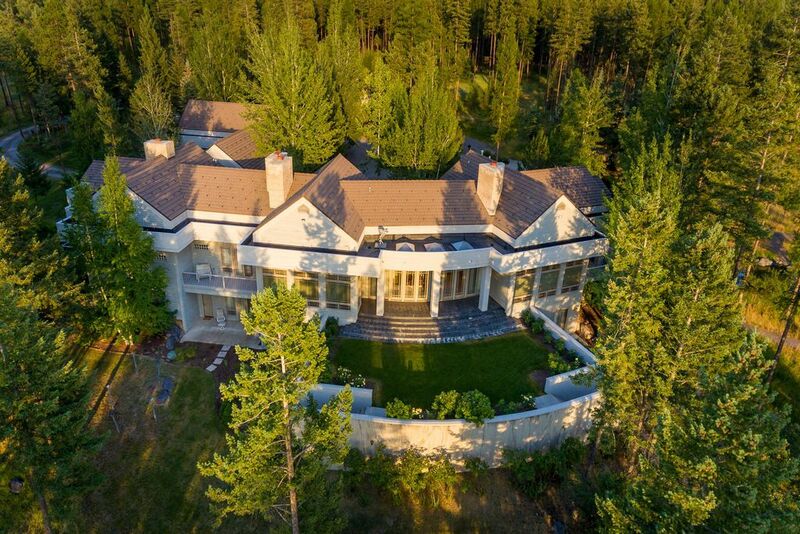 This ranch-style mansion with contemporary flair was built in 1995 and is situated on just under 34 acres of land in Bigfork, MT. The 10,699 square foot home features four bedrooms, four full and six half bathrooms, foyer with vaulted ceiling, sunken formal living room with fireplace, formal dining room, gourmet kitchen with double islands and butler's pantry, breakfast room, family room with vaulted ceiling and fireplace, wood paneled home office/library with fireplace, lower level 16-seat home theater, an expansive craft room, and garage parking for five cars. Outdoor features include a porte-cochere, terrace, balcony, patio, deck, mini pond with waterfalls, and an equipment building. Situated on six acres of land with 1000' of golf course frontage, this French-inspired mansion was built in 1998 and was constructed of the same limestone that built the world-renowned Biltmore Estate. The exquisite yet livable home features approximately 12,558 square feet of living space with five bedrooms, six full and three half bathrooms, two-story foyer with floating winding staircase, elevator, formal living and dining rooms with fireplaces, wood paneled great room with fireplace and wet bar, country-style gourmet kitchen, butler's pantry, breakfast room, four-season screened porch, sun room with fireplace, wood paneled home office/library, expansive upper level recreation room with wet bar and gaming area, an exercise room with a professional indoor driving range, wine cellar, two laundry rooms, and a four-car garage. 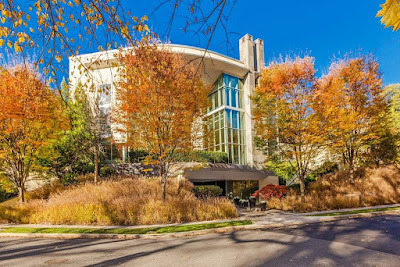 Outdoor features include a gated entrance, motor court, two fountains (one is a sculpture fountain), balconies, expansive multi-level terraces, an Amdega conservatory, sculpture garden, pergolas, pool patio, swimming pool, and a separate spa. 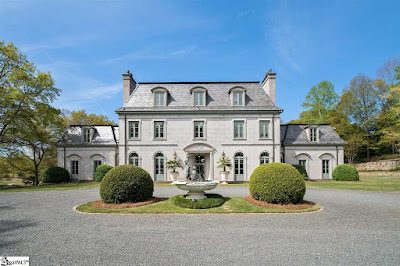 Set high on 2.51 acres of land at Biltmore Park in Asheville, NC, this French-inspired stucco and stacked stone mansion was built in 2002 and comes with year-round Blue Ridge Mountains views. It features approximately 9,560 square feet of living space with five bedrooms, five full and two half bathrooms, two-story foyer with floating spiral staircase, sunken two-story great room with stone fireplace, formal dining room with fireplace, country-style gourmet kitchen with stainless steel appliances, breakfast room, wood-paneled home office/library with fireplace, an additional home office, an upper level family room with fireplace, a screened porch, a carriage house with art studio, and garage parking for five cars. Outdoor features include a gated entrance, porte-cochere, motor court, covered porches, gated pool patio, and a free form swimming pool. 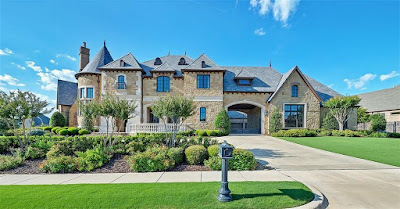 This European-inspired brick, stone, and cast stone-accented mansion in Keller, TX was built in 2009 and is situated on just under an acre of land. The stately home features approximately 8,654 square feet of living space with five bedrooms, five full and two half bathrooms, foyer with winding floating staircase, two-story great room with stone fireplace and exposed wood beams, formal dining room with wood paneled coffered ceiling, butler's pantry, gourmet kitchen with double islands and breakfast area, a rear staircase, wood paneled home office with vaulted ceiling, expansive recreation/game room with wet bar, 400-bottle wine cellar, an eight-seat home theater, exercise room, and a six-car garage. Outdoor features include a gated porte-cochere, motor court, terraces, covered and open patios, fireplace, BBQ kitchen, pergola, and a swimming pool with spa. 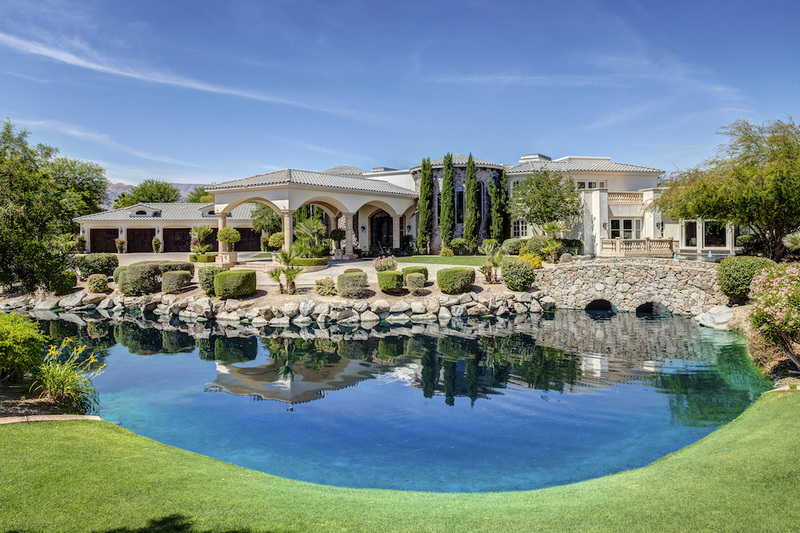 Built in 2007 and sitting on nearly five acres of land in Rancho Mirage, CA, this Mediterranean-style mansion and its grounds are presented as a private five-star desert resort. The expansive home boasts approximately 17,870 square feet of living space with seven bedrooms, seven full and two half bathrooms, two-story foyer with two floating winding staircases, two-story great room with marble flooring, formal living and dining rooms, gourmet kitchen with stainless steel appliances, breakfast room with step ceiling, family room with fireplace and media center, wet bar, wine room, home theater, home gym, sauna, garage parking for 10 cars, and much more. 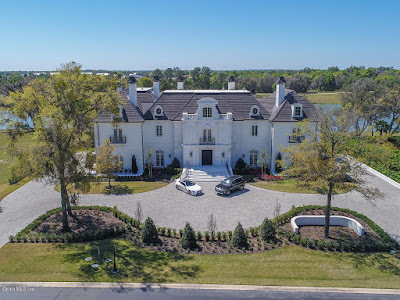 Outdoor features include a gated entrance, porte-cochere, motor court, terraces, resort-style swimming pool with spa and grotto, BBQ kitchen, tennis court, baseball diamond, formal gardens, three ponds, and a guest house with two bedrooms and two bathrooms. 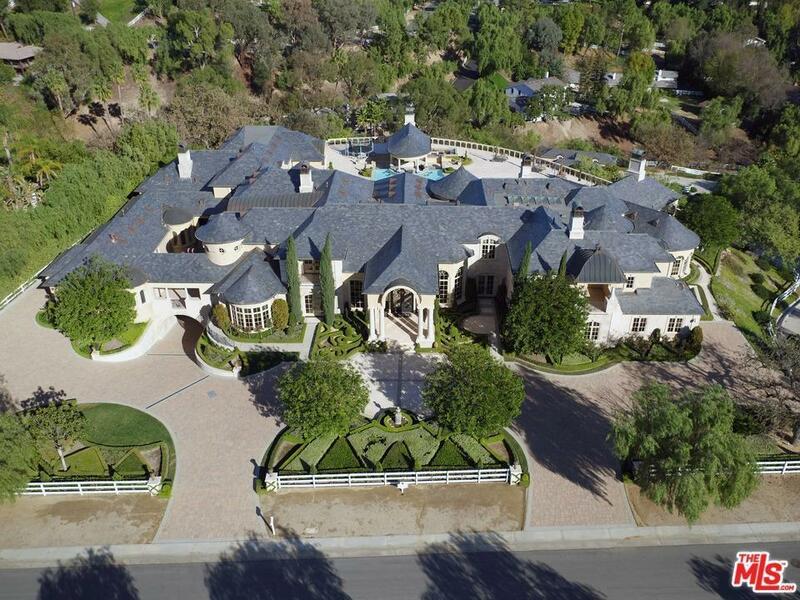 Built in 2009 and situated on 2.82 acres of land with sweeping views of the Hills, this French Normandy mega mansion in Hidden Hills, CA features approximately 20,987 square feet of living space with eight bedrooms and 11 full and two half bathrooms. 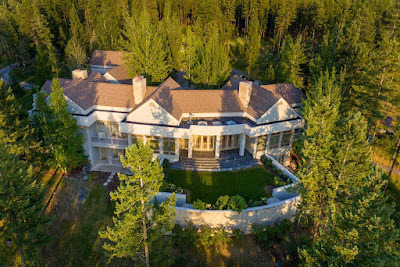 It also has a two-story foyer with double sweeping staircase, glass-enclosed elevator, two-story great room, formal living room, formal dining room, gourmet kitchen with double islands and planning desk, breakfast room, family room with fireplace and vaulted ceiling, wood paneled home office, wine cellar with tasting room, home theater with seating for 10, two-story home gym, spa with massage room, and garage parking for up to 10+ vehicles and so much more. Outdoor features include a motor court, portico, formal gardens, balconies, patios, two BBQ kitchens, loggia, cabana, and swimming pool with spa. The property also includes a separate 3,700 square foot guest house with separate driveway.